Plimmerton Beach and Porirua harbour entrance (centre), with Pauatahanui Inlet and rainbow distant left. Titahi Bay, Whitireia Park and Colonial Knob far right. 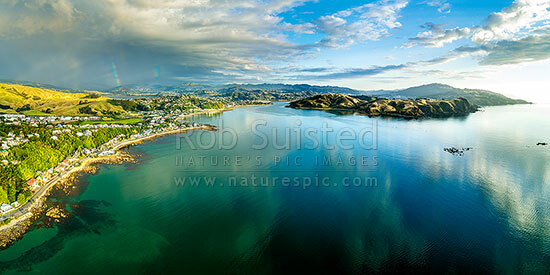 Aerial panorama, Plimmerton, Porirua City District, Wellington Region, New Zealand (NZ), stock photo.